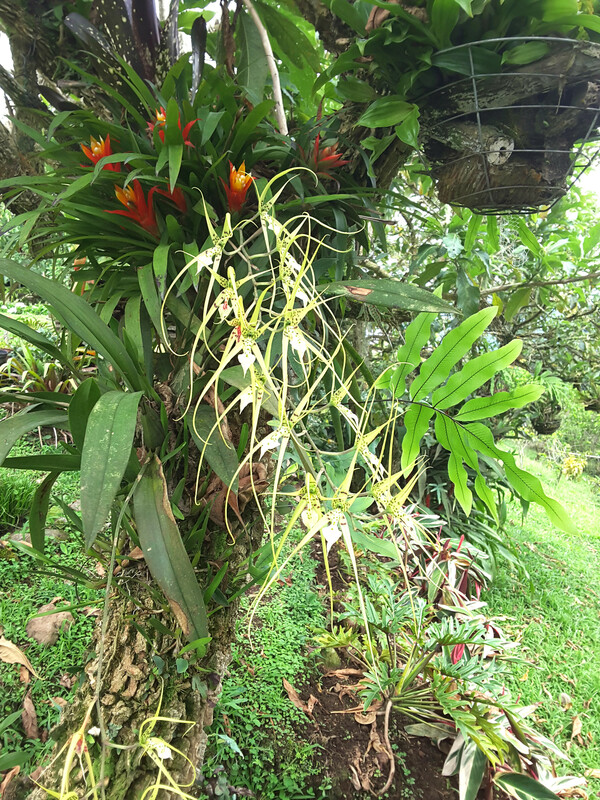 Garden Lovers have a lot to see and learn from in the Turrialba region. First of all, its area stretches out from 600mt down in Turrialba town, to 3340 mt up at the top of the Turrialba Volcano. In other words, over a distance of 30km the landscape rises almost 2800 mt. Or put in other terms, almost 10mt every 100mt. This is a lot. And together with the rains from the Caribbean and the tropical climate, this provides for a great diversity of landscapes, ecosystems and plant species. 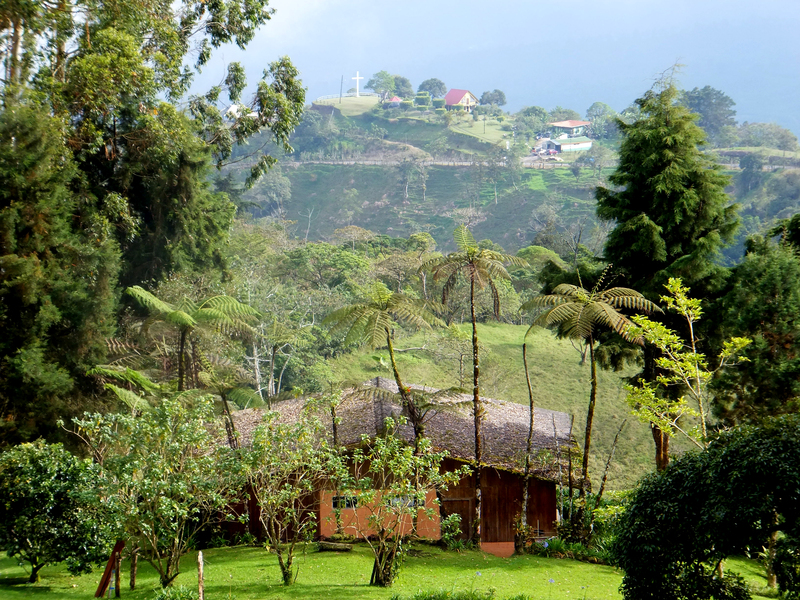 Turrialba is a Garden Lover’s Paradise. The cloud forest area in this region starts a little higher up on the Turrialba Volcano. Yet, some ferns will find the right Eco niches and thrive all the same at lower levels. Even right in the town center. All it takes is enough humidity, the right shade and an undisturbed spot. The three photos included illustrate my point. 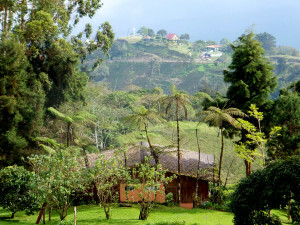 The first is of a dairy farm on the Turrialba Volcano, in the district of Santa Cruz, at around 1700mt asl. Tall tree ferns adorn the farmhouse. As if they were always there. While garden lovers make a great effort to grow them, here they are part of the natural landscape. In fact, they grow naturally along the creeks, rivers and patches of cloud forest in the area. The second photo is of the old railway tracks crossing the Colorado River right in the middle of town. As you can see, in the dense shade of a old mango tree and above the running water of the Colorado river. 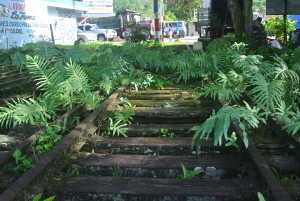 Thus the railway tracks have with time, turned into a blue-green fern garden. So, after a hundred years or so, the in-destructable tropical hardwood undergoes a natural facelift. No landscape architect could have achieved a better result. It is just fabulous to look at and admire this! The third photo is of a guitite tree (Acnistus arborescens) hosting an entire eco system, including orchids, ferns and bromelias. The guitite grows between 700 and 1500m asl. More than 40 bird species eat its golden berries, so it is a favorite in many gardens. As such it is a favorite the the garden of Guayabo Lodge as well.